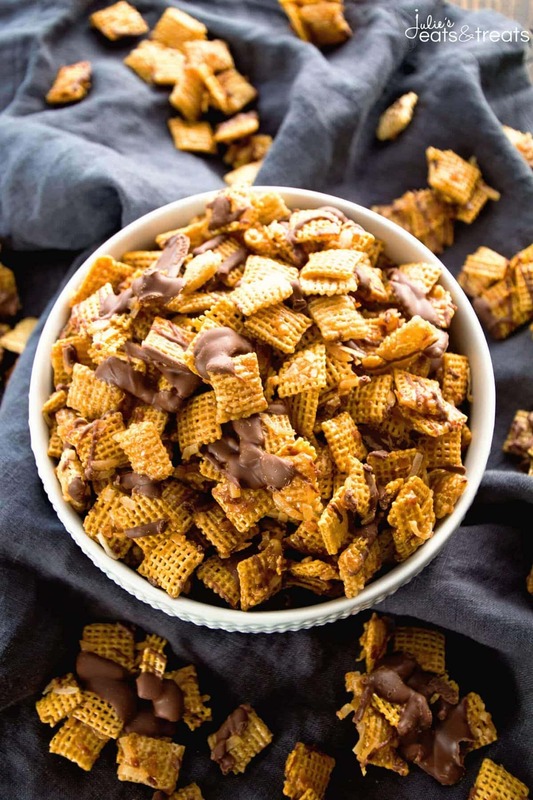 Samoa Chex Mix ~ Easy Snack Mix Loaded with Toasted Coconut, Chocolate and Smothered in Caramel! Anyone else out there have no self control when it comes to any snack mix other than me? Put it front of me and it’s gone. I have no self control. It’s terrible. An utter disgrace! And it’s so easy to rationalize as you grab a handful here and a handful there. It really doesn’t add up does it? 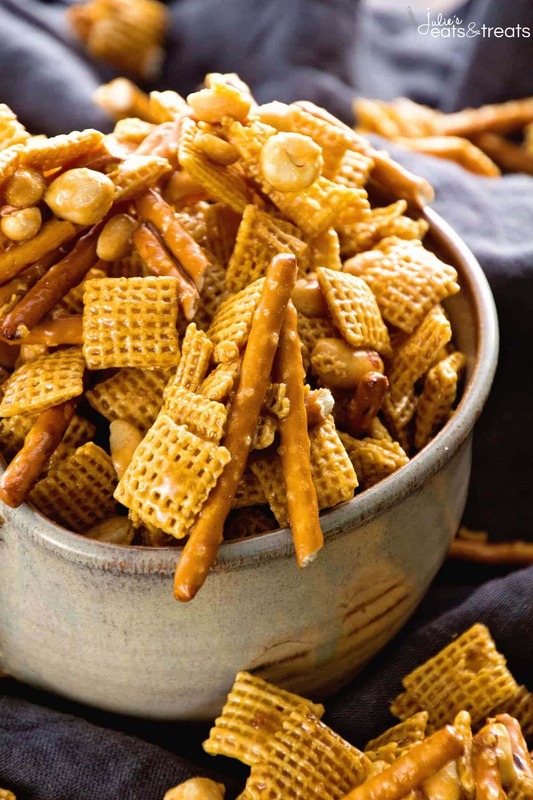 Some of my favorites are Ranch Snack Mix, Sweet & Salty Cashew Chex Mix, and Taco Chex Mix! 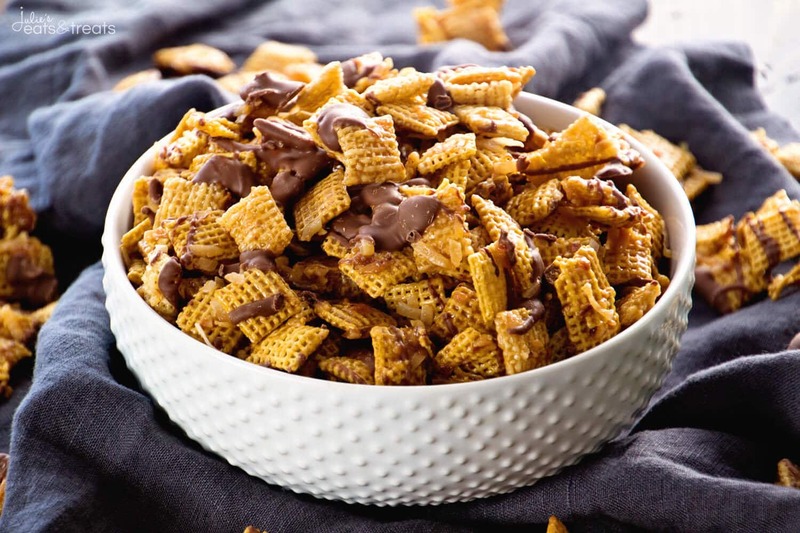 This fall I made this amazing Caramel Chex Mix because my coworker kept raving about his Mom’s recipe and I was like, ok let’s hand that baby over, I need to try it. Needless to say I was NOT disappointed. Then it got me thinking. I mean it’s like caramel, chocolate and coconut go together like peanut butter and jelly in my book so I knew I had to make a batch with a Samoa twist on it for Girl Scout cookie season, which is like the best season ever right?? Samoas are totally my favorite, how about you? Thin Mint is a close second and to be quite honest I’ll take any of them! Speaking of the best snack mixes my Mom brought me a batch of her homemade Chex Mix the other day to welcome us home with the new baby. She actually brought way more than that! She made her famous lasagna for us too! It was devoured. Seriously the BEST! Anyways… I’ve been hoarding the chex mix to myself. The girls like the pretzels which is fine by me, but the rest, all mine! I can’t believe I haven’t shared that simple, traditional recipe on the blog but I figure everyone all ready has their version for themselves. Or maybe I’m wrong? Let me know if I should share it!! But really, you could bring me any food right now and I’d gladly accept as long as I don’t have to make it! You should see me at night. As soon as I get the girls in bed and Koert is falling asleep I’m rushing about trying to climb into bed as soon as I can. Those hours of sleep are precious! The whole “sleep when the baby sleeps” is a lot easier the FIRST time around rather than when you have two older kids running around. So, I sleep when they baby sleeps at night which is often not enough. Although the hubs is home for a few days and he’s pretty amazing. He takes the kids downstairs and let’s me catch a few more zzzz’s before I get up in the morning right now. I’m dreading when he goes back to work. He got a new job and he could have had 6 weeks of paternity leave if he’d been working there a year. Unfortunately, he missed that by 7 months. Dang! I didn’t plan that well at all did I? So, if you make a batch of this share half with me ok? 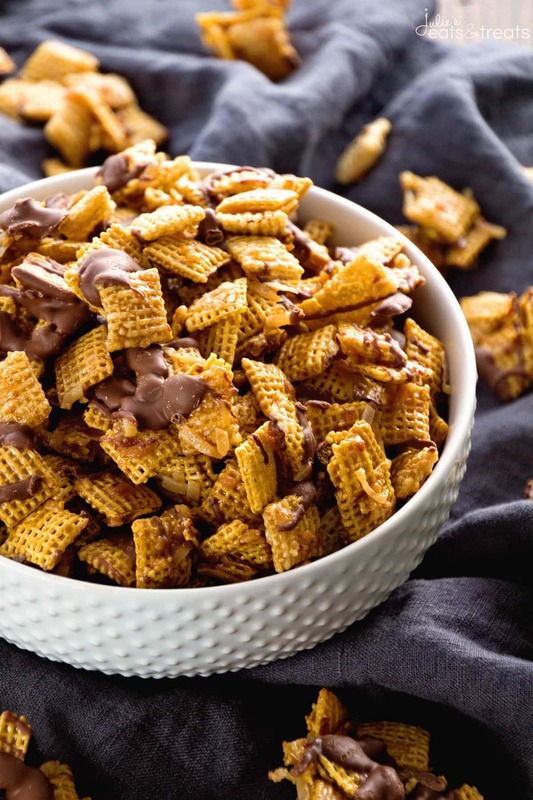 Easy Snack Mix Loaded with Toasted Coconut, Chocolate and Smothered in Caramel! 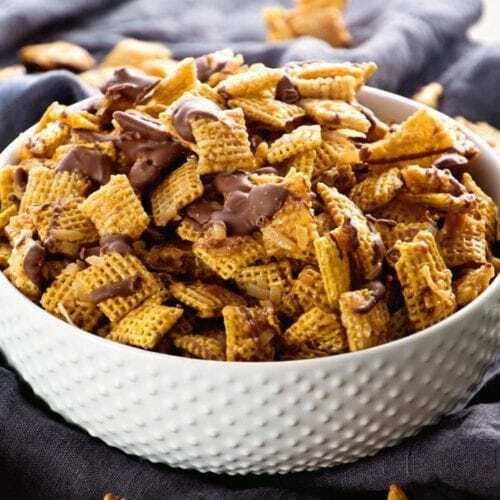 In a brown grocery bag mix together Chex cereals.You can double bag this if you desire. Spread mixture on prepared wax paper. Put chocolate chips in small bowl. Microwave for 30 seconds, stir and microwave an additional 15 seconds. Repeat until melted. Drizzle over cereal. Let cool completely. Break apart when cool. 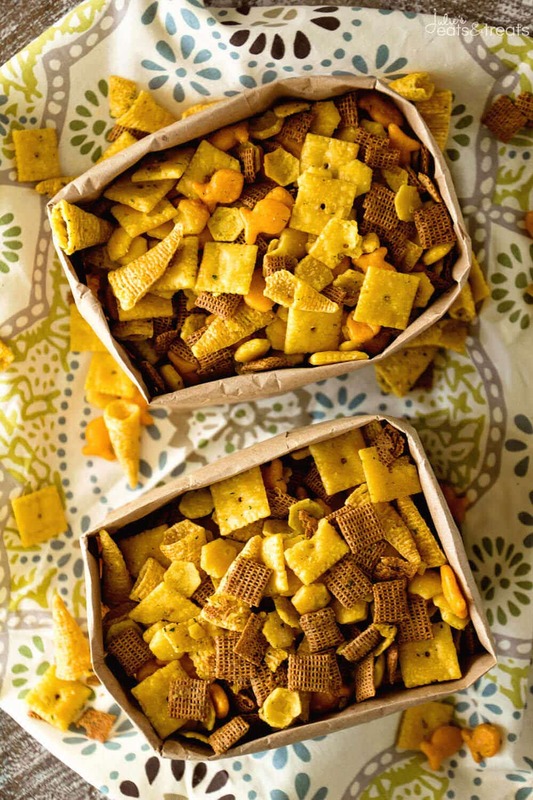 More Easy Snack Mix Recipes! I totally agree with the whole sleep when the baby sleep is much easier the first time around!! This snack mix has my name written all over it!!!! I can’t resist a good sweet and salty combo! !